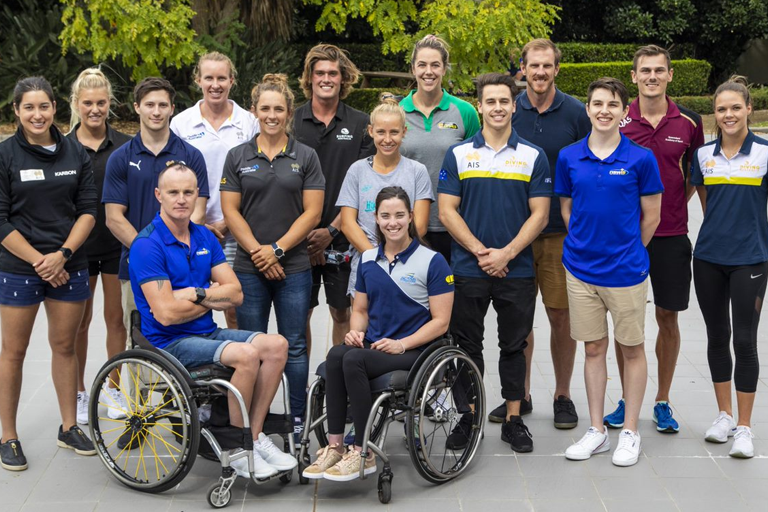 Five NSWIS Scholarship Holders join the 21 athletes from 13 sports have been selected to be the inaugural Lifeline Community Custodians, a program with the Australian Institute of Sport (AIS) that will see athletes become advocates for mental health and positive community spirit. Belle Brockhoff, Erik Horrie, Declan Stacey, Gordon Allan and Jo Brigden-Jones will be involved in the program, jointly designed by the AIS and Lifeline Australia to reduce the stigma of mental health and promote the positive contributions athletes and sport can make to their communities. Olympic paddler Jo Brigden-Jones works full-time as a paramedic alongside her sporting career. “I’ve wanted to be a paramedic since I was 10, long before I even picked up a paddle and dreamed of becoming an Olympian,” Brigden-Jones said. Made a ward of the state at age seven, five-time Paralympic rowing world champion Erik Horrie said he was keen to share a message of hope. “I’ve also been at rock bottom, and I know it takes more of a person to ask for help than someone who puts up a wall and says ‘I’ve got no issues’,” Horrie said. AIS Director of Athlete Wellbeing and Engagement, Matti Clements, said the team of Community Custodians would spend the next 12 months raising mental health awareness in their communities and their sports. “At the AIS we know the positive influence sport and athletes have in their communities and the inspiration they provide, so this program is about spreading that positivity far and wide across Australia,” Clements said. Lifeline Australia CEO Colin Seery said the organisation was proud to partner with the AIS and thanked the Community Custodians, who join a national movement of more than 10,000 Lifeline volunteers and 1,000 employees. “When these athletes talk in support of Lifeline, they will be helping to reduce stigma and shape a more compassionate society, one that focuses on bringing people together and reducing isolation,” Seery said. “They will be helping families to ensure their loved ones are kept safe. “In 2017, there were 3,128 lives lost to suicide in Australia, a nine percent increase on the year before and one life lost every three hours. Every life taken is a son, daughter, mother, father, brother or sister lost for ever. Australian Opals women’s basketball captain Jenna O’Hea will lead the team of Community Custodians, having lost her uncle to suicide last year and then initiating a Lifeline round in the Women’s National Basketball League. “My uncle was 46. People often tend to put on a brave face. You don’t know what they’re going through. So just in our family, from this we’re reaching out more and trying to have more open and honest conversations, which aren’t always easy.